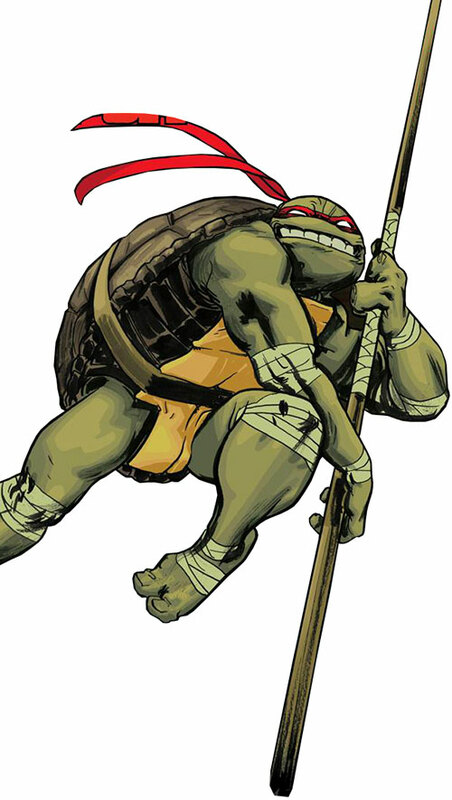 Known Relatives: Raphael (Brother), Leonardo (Brother), Michaelangelo (Brother), Splinter (“Father”). Donatello possesses several of the species wide adaptions that one would find in reptiles classified as turtles (chelonians). 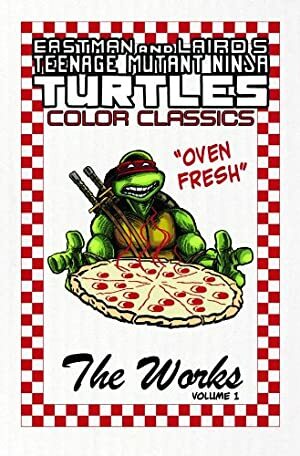 Presumably the mutagenic ooze converted Donatello into a warm-blooded organism (unlike normal turtles). A skilled practitioner of the Bojutsu martial arts style. Outside of his physical attributes, Donatello possesses a genius level intellect. Despite his not receiving any formal education, he is capable of understanding complex concepts with ease (especially those within the field of software development and hardware engineering). He’s also adept at repairing conventional technology when given the right materials. 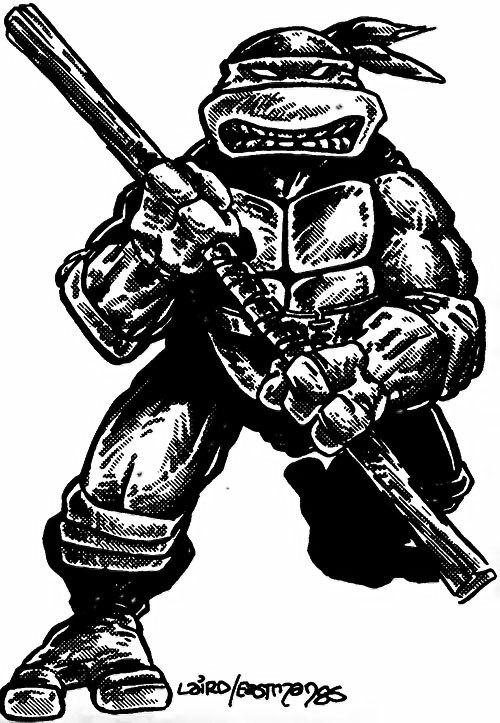 Donatello uses a long sturdy bo staff in combat. Like all of his brothers, he also keeps a reserve of shuriken on his person at all times. Like all of his brothers, Donatello appears to be a large bipedal turtle. His body is hairless, has no visible ears or nose and is a deep green colour. His hands and feet are three fingered/toed, and his eyes are jet black. Unlike a normal turtle, his eyes point directly forward and are distinctly human in appearance (if not unusually large). 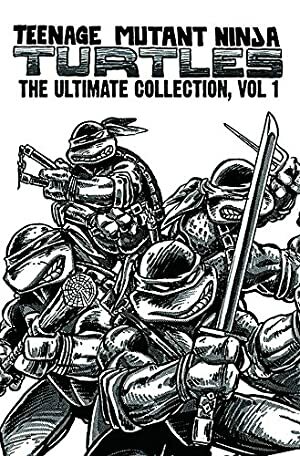 Donatello is the tallest and leanest of his brothers. 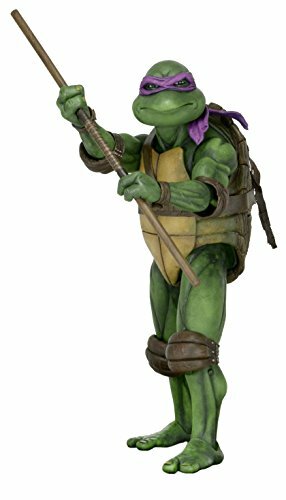 Donatello has a large and pronounced shell situated in the centre of his back. It is clearly a part of his body, and extends across the entirety of his torso. The portion of the shell that covers his chest, stomach and crotch area is a light brown in colour. With his shell protecting his modesty as well as his vitals, Donatello doesn’t normally wear cloths unless he is attempting to hide his mutated features from humans. A battered leather belt that he uses as a harness/holster for his weapons. Light strips of cloths around his joints (wrists, elbows, knees, and ankles). A red strip of cloth that he wears around his eyes when expecting combat. The cloth resembles a domino mask while on, but in truth does little to protect his identity. Of the four brothers, Donatello is the quietest and most pensive. He doesn’t share their love of combat. While he takes his lessons seriously, if given a choice he will spend his time working out an interesting mental puzzle or playing with a computer instead of practicing his ninjutsu. He constantly searches for a better (and often more modern) way of dealing with the issue at hand. He embraces technology that his siblings and father would not. 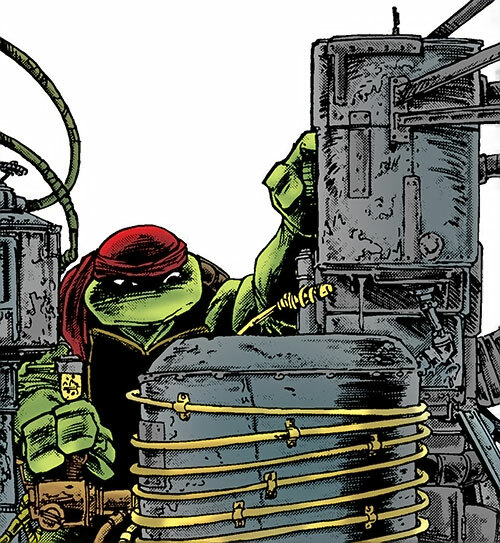 Donatello scientific mind and practical manner has made him the “odd duck” of the family. The others have similar (if still varied) interests that he simply doesn’t share. Skin Armor: : Partial Armor, Can be bypassed by a Trick Shot (- 2FC). Acrobatics (Athletics, Climbing)*: 05, Gadgetry: 07, Martial Artist: 05, Military Science (Camouflage, Danger Recognition): 08, Scientist: 07, Thief (Security Systems, Stealth): 09, Weaponry (Ninja weapons): 05, Weaponry (Staves): 06. Familiarity (Automotive Mechanics, Japanese History, Ninja Lore), Languages (French, Japanese), Scholar (Computer Repair, Mathematics, Mechanical Engineering, Software Development). Raphael (High), Michelangelo (High), Leonardo (High), Splinter (High), April O’Neil (High), Casey Jones (High). Bo Staff [BODY 04, EV 04 (06 w/Martial artist)].